Sweet Woodruff is a low-lying plant found in woodlands, parks and urban gardens. It enjoys rich soil and shaded areas sprouting a horizontal rhizome topped with erect herbaceous quadrangular stems. These are covered with small spatolate leaves formed in a whorl. It has several common names such as Woodruff, Wild Baby’s Breath, and Master Of The Woods. The flowers are small and white and bloom between May and June. The plant has a fragrant odour when the foliage is crushed or cut, and the aroma increases when it is dried. The dried leaves and stem are used separately or mixed with other fragrant plants for drinks such as wine, syrup, brandy, tea, or to enhance the flavour in sausages, jelly, jam and ice cream. Sweet Woodruff has been used as a sedative, antispasmodic, diuretic, and to cure inflammation. Leung AY, Foster S. 1996. Encyclopedia of Common Natural Ingredients Used in Food, Drugs and Cosmetics. New York, NY: J. Wiley & Sons Inc.
Soltani A. 2004. Encyclopedia of traditional medicine (Medicinal plants) Tehran: Arjmand publication; pp. 290–291. Mascolo N, Autore G, Capasso F, Menghini A, Fasulo MP. 1987. Biological screening of Italian medicinal plants for anti-inflammatory activity. Phytother Res. 1:28–31. Duke JA. 1989. Handbook of Medicinal Herbs . Boca Raton, FL: CRC Press. Chevallier A. 1996. 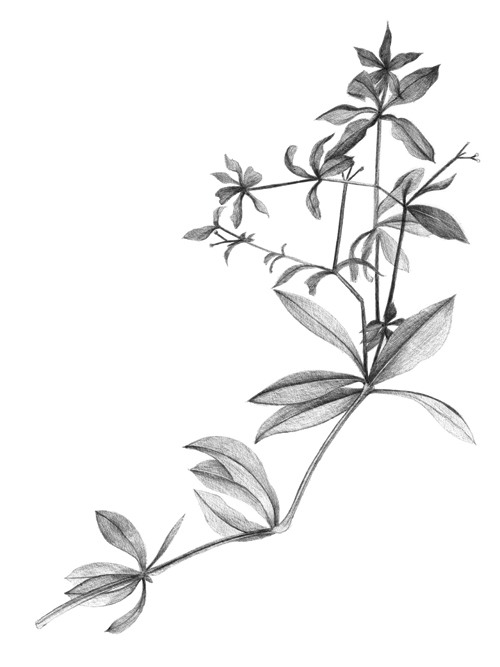 The Encyclopedia of Medicinal Plants . New York, NY: DK Publishing Inc.
Kahkeshani N. Farahanikia B. Mahdaviani P. Abdolghaffari A. Hassanzadeh Gh. Abdollahi M. Khanavi M. 2013. Antioxidant and burn healing potential of Galium odoratum extracts. Research in Pharmaceutical Sciences 8: 197-203. Gruenwald J, Brendler T, Jaenicke C. 2007. PDR for herbal medicine. 4th ed. Montvale: Medical economics company, p. 835. Dobelis, IN, ed. 1986 Magic and Medicine of Plants. Pleasantville, NY: Reader's Digest Association Inc.
Laub E, Olszowski W, Woller R. 1985. Woodruff and spiced wine. Pharmaceutical and food chemistry. Dtsch Apoth Ztg. 125:848-850.